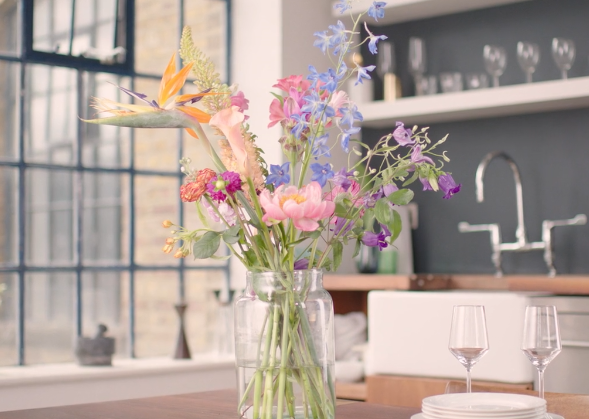 We recently produced a ‘thumb-stopping’ online ad for Bloomon, a project we are very proud of. This case study will cover the process to make their initial ad, and how Bloomon saved a lot of money sticking with us for their subsequent television ad campaign. Bloomon is a London-based subscription flower delivery service from the Netherlands. We were approached to create a video ad for their upcoming Facebook campaign. The target audience was female, aged 30 to 50 years old. Bloomon knew this audience could be targeted demographically via Facebook, thus they wanted an engaging video that would grab them from the word ‘go’. The unique thing about Bloomon, which we wanted to showcase, is that they offer flowers directly from the grower to the customer’s door. Consequently, the flowers stay fresher longer. Embracing a “less is more” philosophy, they also provide spacious designs, which are devised to encourage customers to use their own personal touch. We wanted to reflect this freshness and personalization in the video ad. We utilised a combination of live-action with animation, using beautiful imagery of the flowers in a cinematic setting. The video was designed as a narrative, showing the journey of the flowers from exit door to the recipient. Rather than using a voice-over, we input minimal on-screen text as a means of communication. This way, with Facebook’s new auto-play feature, the viewer wouldn’t necessarily need to have sound to understand the ad. You can read more about the specifics of production here. While the advertisement was originally designed to fit with Facebook’s specific format, it would go on to be used for much more. Bloomon was so happy with the original Facebook ad, we were asked to adapt it to become a Europe-wide TV commercial. This adaptation was done all in-house. Because we treated this social media ad as a high-quality, cinematic project, we were more easily able to adapt the Facebook video to be suitable for television. Since we shot in 4k, we were able to ‘punch-in’ on certain shots (effectively treating ‘one camera as two’) in order to increase our variation. We were also able to reframe certain shots, since the square footage was our priority during initial shooting. We also took precautions during our original shoot and filmed much more footage than was required. This increased our options for the television version to make it more visually pleasing. Aside from re-sizing, we also extended the advertisement. The Facebook ad was 20 seconds long, and when we adapted it, it grew closer to half a minute. For the television ad, we used bespoke music composed especially for the longer version. We also managed to save the client a lot of money because we did the television deliveries in-house. We were responsible for Clearcast procedures, ad-stream deliveries; we supervised this process ourselves and managed to do this process very quickly. Because there was no 3rd-party involved, the procedure was a lot smoother than if Bloomon had brought in an outside agency. The moral of this success story is, when making a promotional video, it always has the potential to become more.